How to Become a Court Reporter in New York? How to Become a Certified Shorthand Reporter in New York? How Much Do Court Reporters Earn in New York? Court reporters also known as Certified Shorthand Reporters (CSRs) or Court Stenographers transcribe spoken or recorded speech into written words, which then serves as the official and legal record for depositions and court hearings. 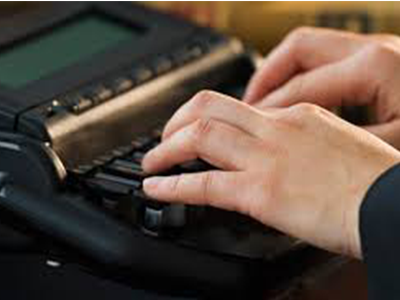 In order to become a court reporter anywhere in anywhere in the US, including New York, you will need to have two basic skills – typing with accuracy and typing at a fast speed. The good news is that you can learn both of these skills in court reporting programs. If you are interested in becoming a court reporter in the State of New York then there are certain educational requirements you will need to fulfill first. These requirements may not be mandatory, but they will help you become a successful court reporter. A variety of court reporting programs are offered all across New York to help you enter this field and then excel in it. These programs may be offered in a traditional classroom setting or online. To know more about these programs, check with your local continuing education school(s), technical institutes and community colleges. Another equally important facet of these programs is to help you type accurately at a certain speed. The objective is for students to type 225 words per minute. This will help you get certified or licensed later. The State of New York does not require a license to practice as a court reporter, however The New York State Department of Labor’s official website states that only individuals certified by the Board of Regents may use the title of the certified shorthand reporter. Meet experience requirements – Three years of experience if you meet the educational requirements or five years of experience if you do not meet the educational requirements. Meet education and examination requirements – Have a high school diploma or GED. Additional educational requirements can be fulfilled if you hold a certificate, diploma or associate degree in court reporting from an accredited institute. Examination requirements – You must pass the Registered Professional Reporter (RPR) examination administered by the National Court Reporters Association (NCRA). This examination consists of the Written Knowledge Test (WKT) and three sections of a skills test. Once you are certified, you need to look for a court reporter’s position in your desired location. This could be the shortest or the longest phase in becoming a court reporter in New York. For beginners, join a professional body like the New York State Court Reporters Association (NYSCRA), where you will not only network but also find latest job openings. Also do not forget, you will need to obtain continuing education credentials to renew your certification. According to the US Bureau of Labor Statistics (BLS), court reporters nationally earned $55,120 (median annual) in May 2017. However, BLS quotes $89,140 (annual mean wage) for court reporters in the State of New York in May 2017. In short, the state pays a lot more to court reporters than what they earn in many other states. This makes the State of New York the highest paying state in the United States. According to BLS’s May 2017 statistics, a total of 1,440 court reporters were working all over the State of New York. This makes New York the second biggest employer of court reporters in the United States after Texas where 1,640 court reporters worked as of May 2017. Interestingly, Texas is fifth best paying state for court reporters. In short, the State of New York is the ideal state to work as a court reporter both in terms of earnings and employment.